INTRODUCTION: Hallux surgery is the most commonly performed elective surgery in the foot and ankle. 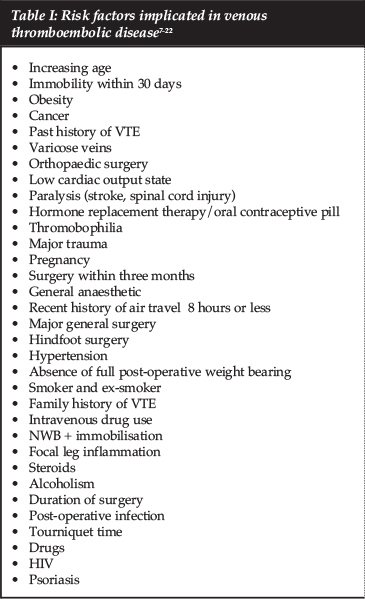 As with all surgery, there are many potential complications quoted in the literature. Venous thromboembolism (deep vein thrombosis and pulmonary embolism) prophylaxis, however, is not adequately addressed and remains controversial. MATERIALS AND METHOD: This prospective study includes 100 patients who underwent hallux surgery. Risk factors implicated to increase the risk of developing venous thromboembolic disease as well as anaesthetic time, thigh tourniquet time and regional anaesthetic blocks were documented. Compressive ultrasonography was performed in all the patients post-operatively. RESULTS: There was one incident of calf deep vein thrombosis (DVT). No patient developed a pulmonary embolus. The one patient who developed a DVT was not at any higher risk than the average patient in the study. CONCLUSION: As a result of the low incidence of venous thromboembolic disease in this study, the authors do not recommend the routine use of chemical venous thrombo-prophylaxis in patients undergoing hallux surgery. The decision to give post-operative anticoagulation remains the surgeon's responsibility. The duration of prophylaxis will depend on when the patient is fully mobile. Keywords: hallux surgery, venous thromboembolism. Hallux surgery, with its varying degrees of complexity, is the most common elective surgery performed on the foot and ankle. The purpose of this prospective study was to determine the incidence of VTE and hence the need for chemical prophylaxis in hallux surgery. The inclusion criteria were all consecutive patients requiring hallux surgery (hallux valgus correction, first metatarsophalangeal joint [MPJ] replacement and first metatarsophalangeal joint arthrodesis), from 2011 to 2013. All patients were 18 years and older. Exclusion criteria were patients already on anticoagulants, previous venous thromboembolic disease and patients requesting anticoagulation. Human Research Ethics Committee (Medical) approved the study (Clearance Certificate M110625). All patients completed a 'Thrombosis Risk Factor Assessment' form, which has been endorsed by the Southern African Society of Thrombosis and Haemostasis (SASTH) (Figure 1). History of smoking, anaesthetic time, thigh tourniquet time and regional anaesthetic block were recorded, in addition to the above risk factors. One hundred (92 females and eight males) consecutive patients (146 feet) were eligible for inclusion. The mean age was 54.1 years (range 18 to 79 years). Clinical examination for DVT was performed post-operatively while in hospital and at every follow-up visit (at 1, 2, 4, 6 weeks). All patients were routinely subjected to compression ultra-sonography23 between two and six weeks post-operatively. There were 130 hallux valgus corrections (viz. Lapidus ; proximal open wedge , scarf , chevron  and Akin  osteotomies), 10 hallux MPJ arthrodesis and 6 MPJ replacements). Associated forefoot surgery (viz. hammer toe and mallet toe corrections; interdigital neuroma excision; Weil osteotomies; bunionette resections and interphalangeal fusion) was performed in 38 patients. Regional blocks were used in 146 limbs (72 popliteal and 74 ankle blocks) in conjunction with the general anaesthetic. Average anaesthetic time was 108 minutes (range 45 to 210 minutes) and average thigh tourniquet time was 59 minutes (range 20 to 135 minutes). The total risk factor score was 5.1 (range 2 to 10). 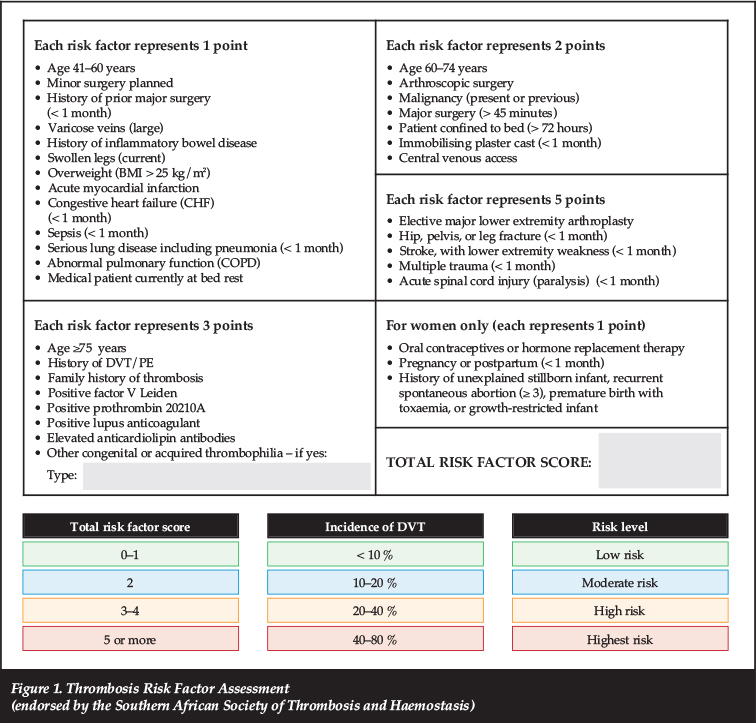 The total risk factor score is the score that determines the risk of developing a DVT. This is calculated from the thrombosis risk factor assessment form. The higher the score, the higher the risk. There was one (1%) incident of a symptomatic DVT (calf) one week post-operatively. Our one patient who developed a DVT was a female who had a unilateral Lapidus procedure and an associated interdigital neuroma excision. The anaesthetic time was 105 minutes and tourniquet time 94 minutes. Her total risk factor score was 4. Her risk factors were age (54 years), BMI > 25 kg/m2 and length of surgery (greater than 45 minutes). No patient developed pulmonary embolus. Post-operatively all patients were mobilised on day one in a post-operative wedge heel shoe allowing them to bear weight on the heel as tolerated. No cast was used. This protocol included the patients who had bilateral surgery. This is understandable due to the high prevalence of DVT in total hip replacements (42-57%) and total knee replacements (41-85%). In foot and ankle surgery, however, there is no consensus on the use of chemical thromboprophylaxis and there are no clear guidelines. This is particularly true for hallux surgery. This study has found a very low incidence of VTE. Despite an average total risk factor score of 5.1, the incidence of DVT in our study group was very low (1%). The authors feel that routine chemical thromboprophylaxis in hallux surgery per se is not warranted. Individual patient specific risk factors, however, need to be assessed pre-operatively and measured against a validated scoring system. The decision to give postoperative anticoagulation remains the surgeon's responsibility, as large scale, prospective clinical trials are unlikely to be carried out due to financial constraints. The duration of cover will depend on when the patient is fully mobile. This current study does not recommend the routine use of chemical thromboprophylaxis in hallux surgery. The emphasis therefore, is placed on individual, patient-specific risk factors. Furthermore, the total risk factor score guidelines may need to be revised in hallux surgery by increasing the sensitivity of the total score. There is a need for larger prospective studies to identify the patient undergoing foot and/or ankle surgery who is a potential risk. The authors wish to express their gratitude to Dr Diana Alagem from Diagnostic Radiological Services Inc. for performing the compression ultrasonography pro Deo, and to Mrs Wendy Leppan for the typing of the manuscript. The authors declare no potential conflicts of interest with respect to the research, authorship and/or publication of this article. The authors received no financial support for the research, authorship and/or publication of this article.